The final, which was due the week of December 11, was completed while sitting in her hospital bed preparing for labor. Just a little over 12 hours later on December 12 at 1:30 p.m., Thomas gave birth to her son, Anthony Johnson. KANSAS CITY, Mo. 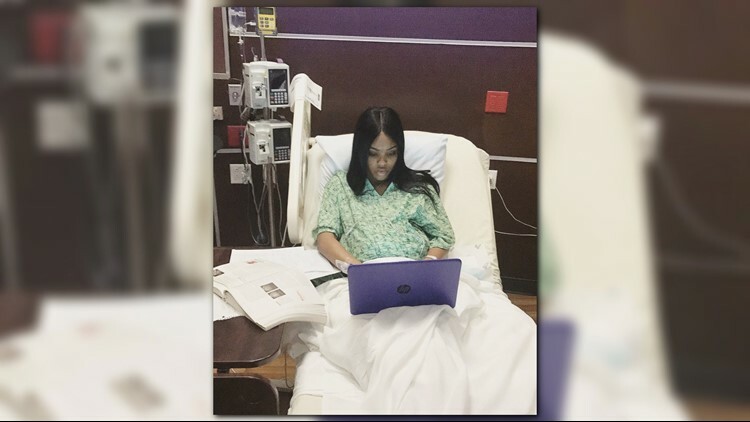 — A college student in Kansas City was determined to finish her college finals on time, even if that meant going through labor when the exam was due. Nayzia Thomas, a sophomore at Johnson County Community College, continued her studies of psychology for 39 weeks until her baby son ultimately gave her what she could no longer avoid: the completion of childbirth. Yahoo! Lifestyle reported that, instead of putting off her final psych exam, Thomas decided to complete her assignment on time. So, she did just that. "It wasn't due until the end of the week," said Thomas to Yahoo! Lifestyle. "But my goal was to try to have everything done before. [I thought] before all this gets crazy, let me hurry up and finish this final." Thomas' mother snapped the shot of the soon-to-be mother. She said the photo "encompassed who her daughter is" and Thomas agreed. "School is so important to me," she told Yahoo! Lifestyle. "I didn't want [the pregnancy] to be int he way. That's what people expect. You're a teen mom, you're a young mother. That's why my mom took that picture." Her tweet showcasing her studies blew up and went viral, receiving nearly 28,000 retweets and 133,000 likes. She followed up with a post-labor follow-up, showing the mother and father bedside with their newborn. Even through a series of events which would be an impossible task with so much pressure, Thomas completed the semester with a 3.5 GPA. "It shows I follow through," she added.